Lone Star: A History of Texas to the Present by T.R. Fehrenbach is not for the those with a short attention span. Nary a photo appears in 725 packed pages – the few illustrations are black and white sketches, sparingly used to illustrate the tale. Daunting as that may be, take the plunge and grab a copy for some bedtime reading, or as the case may be, a lot of bedtime reading. Orlando chides me, and rightfully so, for the book collection that threatens to take over our home. Piles sift into corners of the kids’ rooms, and every bookcase is packed to the gills. Occasionally we’ll take a load to Austin’s famous Half Price Books but regrets follow each of those runs, and the stream of incoming books increases subsequently to compensate. My bedside table has been over run for years: books on cooking, child rearing, psychology and photography top the current piles, shoving aside the New York Times Bestsellers and “Mom-you-have-to-read-this” books contributed by my 13 year old who still snubs the ones I give to her, until, of course, the same one is recommended by a peer. As my obsession with photography has increased, so has my interest in the local scene – if I’m going to photograph it and then write about it, I might as well actually learn something about it in the process. We’ve written dozens of reports on neighborhood statistics but after a while that doesn’t scratch enough of the itch to satisfy, does it? Neighborhood research led to town and city research, then to the Texas Almanac referenced in a post a few days ago, and now to this gigantic book of “The People, Politics, and Events That Have Shaped Texas”. And so it goes . . . for over 700 pages of well-researched and -presented history of the state, starting with the migration of the first inhabitants, through battles big and small (as if any battle is small in the minds of the stakeholders) and on to the present, detailing the participants, politics and peoples engaged along the way. Texas history is splattered with conflict, striking conflict that has yet to subside. The miserable heat, struggles between tribes and hostility of the land itself meant only the strongest and most determined survived and even fewer thrived. While reading this book, one must stop and ponder the soft life we have now – our access to (and abuse of) water resources, the protection we have from the brutalities of the frontier, the relative calm of our air-conditioned homes and cars. Yet, the battles still rage over ideology and the push-pull of the real, or perhaps theoretical, march forward. The population of born-here Texans is dwindling as newcomers move in from elsewhere, bringing with them the beliefs and habits of their own cultures, be it Californian, Mexican or Asian, to name but a few. That, of course, has always been the way throughout history, in Texas and elsewhere. Those that arrive first, resist those that arrive later and cultural clash is inevitable as new ways of doing business and co-existing are established. Lone Star should be on the reading list of everyone who intends to stay here, and those that have been scratching their heads since arrival as to why things are the way they are in this vast border state. Great photo. History! Love history! May have to buy this book, the more pages the better. Nice! 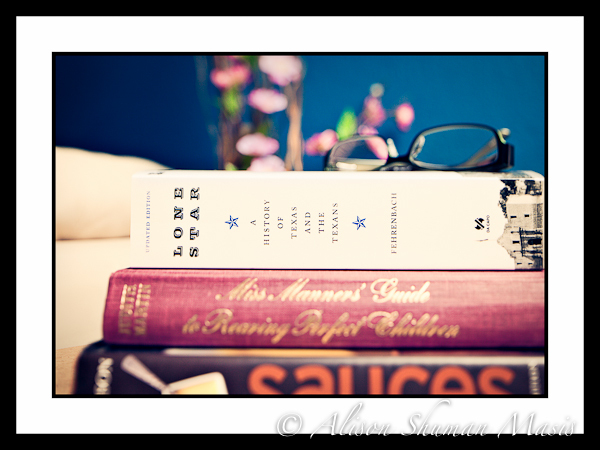 I’m always up for a good book review and beautiful photo. I like the DOF in your shot.